You may remember January 7. You may remember January 7 forever, actually. It was the first icy finger of the infamous Polar Vortex, spawning thousands of social posts in the “you think YOU’RE cold, you should see it here!” vein. But the organization that had perhaps the greatest social success on chilly January 7 may surprise you: Univision – the broadcast and digital information provider focused on American Latinos. 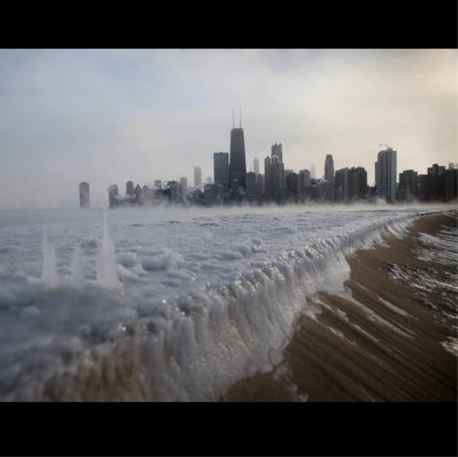 One of the company’s community managers dedicated to the news division (more on Univision’s social structure below), posted to the Univision.com site a user-generated photo of the frozen Lake Michigan in Chicago. Almost instantly, analytics showed spikes of thirty to forty times typical traffic and sharing behavior. While that success was noteworthy, Univision had the culture, insight and technology to double-down on a good thing. One of Univision’s many television shows is Aqui´y Ahora, a weekly news magazine with daily web and social components. 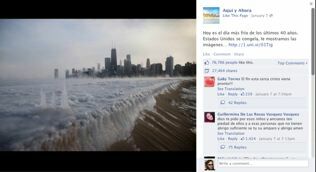 Using Expion, Univision’s social team posted the “frozen lake” image to the show’s Facebook page, where it instantly exceeded baseline engagement expectations. How much so? for a total engagement rate of more than 13 percent. In this current era of diminished average engagement on Facebook (listen to this podcast with me, Mari Smith, and Mike Stelzner for more on that), a 13% engagement rate is almost stupefyingly brilliant. Sure, you could say Univision was in the right place at the right time, and caught lightning (or ice) in a bottle. But to believe that is to massively undervalue the cultural, organizational, operational and tactical alignment that must occur in a complex, information-driven organization to make this actually happen. I could write most of an entire book about this topic, and actually touched on it a lot in The NOW Revolution, my 2011 book with Amber Naslund that is more relevant than ever. But in this post, I’ll summarize the six ways Univision set itself up for social success, and the corresponding lessons that apply to us all. Univision believes, from the executive level down, that social is a major differentiator and key to success. Approximately two years ago, the company determined to fully activate social across the enterprise, and tapped David to design and rapidly scale a social organization that impacts every corner of the company. Companies with a strong social business climate treat social horizontally, not vertically. Social (and social-focused personnel) run throughout the entire organization, like a river, rather than being a siloed, circular thing that must be visited, like a lake (even a frozen one). The social media team at Univision reports up to David, but its members are actually embedded in each of the departments of the company, including news, sports, events, entertainment and marketing, with subject-matter experts (like analytics pros) serving all corners of the enterprise, as needed. Sure, Univision has the culture and the structure to get the frozen Hudson photo syndicated to one of its Facebook pages, but it was also able to do it FAST, before so many people had seen the image elsewhere that they wouldn’t share it on their own Facebook timeline. That’s not just strategic embrace of speed, its functional speed in action. I’ve written before that too often companies put disproportionate faith in social technology, overlooking that the software is only as smart as the people figuring out what to do with it. But, whether its Social Guide for social TV measurement, or Expion for social monitoring and engagement, or proactively working with software vendors to find new and better ways of creating and distributing micro content, Univision is making technology for them, rather than the other way around. As mentioned above, Univision has a dedicated analytics team that was able to find and isolate the original frozen Hudson photo, thus triggering the social syndication process. This is key, because too many companies – including some big enterprise organizations we’ve consulted with here at Convince & Convert – are combining the execution and analytics functions in their organization. Analytics is not a hobby. It gets more complex all the time, and if you’re serious about social success it should be a freestanding role. Not to mention the “fox watching the henhouse” issues inherent in having the people who are doing social also in charge of measuring how well they are doing it. Univision also has put into practice some interesting metrics to better understand social’s impact on its television audience. David says they pay quite a bit of attention to number of tweets per unique tweeter while a television show is being broadcast, looking at that ratio as a measure of fervor and engagement. According to David, the show Mira Quien Baila is the Univision version of Dancing with the Stars. Both shows are on at approximately the same time, but the Univision program has more frequent tweets on a per-person basis, and less week-to-week decline through the season. Another innovative metrics Univision analysts are studying are tweets to specific show-based Twitter accounts, rather than simply counting tweets that mention the show. Tweets that are directed at the show’s Twitter handles per se are believed to be more direct expressions of loyalty and support than non-directed mentions. Indeed, Univision knocked it out of the park with the frozen Hudson photo, and we chronicle big social media wins like that every week in our “Social Media Image of the Week” series, written by Jessica Gioglio of Dunkin Donuts. But there’s SO much more to these successes than meets the eye. I’m glad I got the opportunity to pull back the curtain this time. Which of the six characteristics identified here do you believe is most critical?